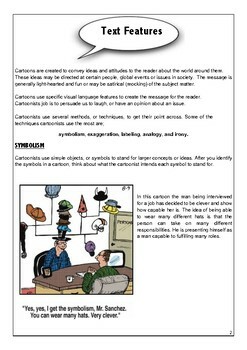 Textual features of cartoons - Symbolism, Exaggeration, Labelling, Analogy, Irony - all definitions and explanation using cartoons as examples. Information on text / thought/ dialogue bubbles for students to follow and examples. The features of the comic strip. Filling in the Gaps , students give situation explanations for cartoon panels. Peanuts Charlie Brown is used as an example. Students are asked to explain a cartoons story. There are three examples for students to create dialogue in illustrated panels. A look at famous cartoons , eg : TinTin. Students look at his personal characteristics and use this information to predict the next actions in a TinTin story panel. Another activity for TinTin involves students designing frames around existing panels to create a front and end to a story. 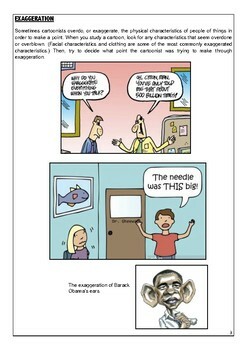 Political cartoons is the last part of the handout with cartoons about the issue of the environment chosen for students. 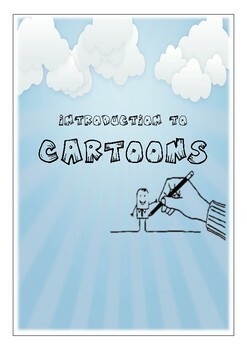 There are questions for the cartoons and information that allows students to unlock the main ideas of the last cartoon. 15 pages in all .